101 assembled. 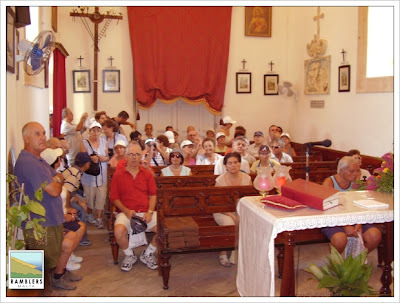 No, they were not Dalmations but a pure breed of genuine ramblers that challenged the heat to start off from St. Dominic Church and up to Tal Virtu. The quiet suburb was soon alive as the start of a new season of walks gripped all and sundry in a flurry of excitement. Once through the gate that lies at the extreme western corner of the perimeter of the Seminary grounds, the country lane was followed down into Il-Wied tal-Isqof, where a hunter displaying his shotgun greeted us amicably and also showed us the way up to the old and derelict summer place that the bishop of Malta had built for himself in the first half of the 17th century. After a close look at the dampish cave under the lush cliff, which still displays a large stone table and a vivid spring of fresh water, the group were welcomed by the President, Lino Bugeja, who then proceeded to give the historical details of the derelict site. It appears the Bishop of Malta at the time envied the Grandmaster and the Inquisitor who both had built a summer residence for themselves in the vicinity. 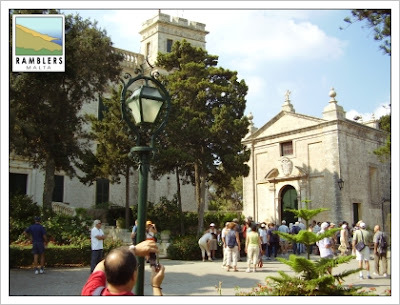 Ramblers in the grounds of Verdala palaceThe group then walked past the Chapel dedicated to St Lucy and St Nicholas of Bari at Gnien il-Far, a justapatronatus of the Testaferrata Viani family, which served as a refugee centre during the last war. And then on to the Verdala Palace grounds, which were thrown open to us by courtesy of the President (unfortunately the palace itself is undergoing restoration and maintenance) and the quaint chapel of St Anthony the Abbot, which was amply detailed by the caretaker there, Mr Mifsud. Mr Mifsud was kind enough to let us through the back gate that leads to the Buskett forest and through this path all could admire the west fa?de of the palace with its imposing staircase. We were running very late and it was only at noon that we arrived at the third palace, the Inquisitor?s at Girgenti. Mr Robert Cutajar from the OPM welcomed the Ramblers and gave a brief description of the place. The Secretary thanked him warmly as he was instrumental to render possible the visits to both palaces. He also explained that Mr Cutajar is the person entrusted by the Prime Minister to liaise with the RAM where difficult people or situations are encountered in the countryside. All ears to the commentary by Mr Mifsud inside the Chapel of St Anthony the AbbotFifteen persons at a time were permitted to tour the halls and view the rooms of the prime-minister?s residence, so well over an hour was spent there. It was at this point that the intended visit to Ghar il-Kbir and Clapham?s Junction was decided to be forsaken. After taking a group photo the ramblers took the road back to Buskett , which was crossed from south to north, and thence on the tarmaced road back to San Duminku, arriving there at around 2.00pm. The numerous turnout, the interesting talks at all the three ?palaces? 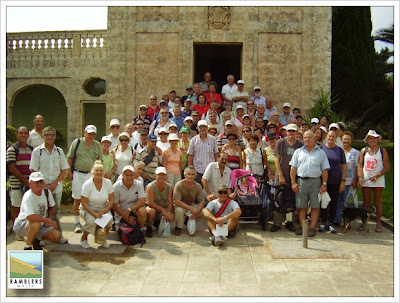 and the engaging walkabouts there did slacken the walk enough to force the cancellation of the visit to the last site. However none was sorry for it as there was more thrown in than any had been bargained for.